Forward Andy Hilbert's decision to return to the AHL came down to a family referendum. 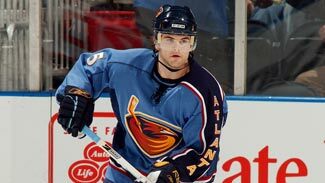 Andy was OK with it, even though he hadn't been an AHL regular since 2004-05. Wife Andrea voted yes, too. Even yellow lab Stanley had his opinion taken into account, but since he wags his tail at nearly everything, it was hard to tell whether he had a grasp of the issue. But, hey, unanimous is unanimous. Two games into the AHL season, it looks like a sound choice and one that could have Hilbert skating back in the NHL soon. Hilbert, 28, rang up a goal and 2 assists in his first two contests with the Houston Aeros. That's the rate he ripped 'em off at five years ago, when he went 37-42-79 with Providence. "The comfort level is really not there," he said. "It's going to take some adjusting -- a new team, a new system. It's a weird feeling playing in the AHL versus the NHL. But in the end, hockey is hockey. I expect a lot out of myself." And why shouldn't he? Hilbert produced 11 goals and 16 assists in 67 games with the Islanders last season, an effort he thought might be worth a little something this season. And a little something was all he got. Minnesota gave him a tryout offer to come to camp, and then signed him to a two-way contract for the season last week. "It was a difficult situation for me, something that was uncomfortable," said Hilbert, who has played in 303 NHL contests. "I expected more options, but that wasn't the case. You aren't a 20-year-old kid coming out of college any more. You have a responsibility to take care of your family." That's where taking a less-than-hoped-for offer to stay settled in North America came in. If age isn't on his side, Hilbert at least thinks he has more going for him now than during his first swing through the AHL. "I'm more of an all-round player," he said. "I'm more responsible in every situation. That's how my game has changed. I've worked too hard and too long for this. If this (going to the AHL) is what it takes to get back to the NHL, that's what it takes. I always believed it will work out. I still do." Krog house hunting -- During his first few days in Chicago, forward Jason Krog was far less focused on coming home again than simply finding a home, period. Krog hustled around the city looking for a suitable place to live. Let's just say he's a far better hockey player than real estate agent. "It's frustrating. I can't find what I'm looking for," he said while driving around last week. "It's nice places in bad areas, and bad places in nice areas. Chicago is such a fun city it's worth it (living downtown). You're missing out if you're not living down there." The line of Wolves fans looking to repay what he's done for the franchise by opening their homes to him forms to the right. Krog, 34, is back in the city he helped win a Calder Cup two seasons ago. A two-year deal he signed with Atlanta in the offseason returned him to the organization, and the Thrashers again made him a huge fish in a smaller pond with a demotion last week. Krog originally had much different plans, and we're not just talking about the NHL here. At the end of last season, when he played with Manitoba, he all but handed out written guarantees that he was Europe-bound. "I totally planned on going over," Krog said. "It was a tough year for jobs over there. I'm not one to look back on things. I'm happy right now. I like winning. And this organization gives you every opportunity to do it." "It's going to take some adjusting -- a new team, a new system. It's a weird feeling playing in the AHL versus the NHL. But in the end, hockey is hockey. I expect a lot out of myself." With Krog and the Wolves, that's a chicken-or-egg relationship. In 2006-07, he contributed 26 points and 54 assists in a mere 44 games. The next season, he went 39-73 to help Chicago hang a championship banner, becoming the first player in league history to win regular season and postseason MVP honors. "The team that they've put together so far, we have an abundance of talent," he said. "I expect a lot out of myself. I can't see why we're not going to be a high-scoring team. I don't see why I can't excel under these circumstances." New hobbies -- One of the many consequences of Philadelphia moving its AHL affiliate, the Phantoms, from its own backyard to Glens Falls, N.Y., is a change in the types of leisure activities available to the players. In Philly, that might have come down to bowling or going to a movie. In Glens Falls, there are a few more earthy options. So the Adirondack Phantoms earlier this week hopped aboard a bus for a ride to the Extreme Adventure Course, which is near Lake George. The fun included wall-climbing, rope-walking high above the ground and various other balancing activities. "I think the Adirondack area brought that out. I've never done anything like that as a team," said Phantoms defenseman Sean Curry. "It was definitely an eye-opener. It was really fun." And the challenges must have created that all-for-one feeling, strengthening the bonds of the team, right? "Guys were messing around, trying to shake the ropes," Curry said. "I guess you call that bonding. A few people fell. If you fell, you dropped 3 1/2, four feet before the (safety) line catches you." Around the AHL -- Martin St. Pierre has appeared in three AHL All-Star Games and entered the season with 90 career AHL goals, but he never had posted a hat trick before scoring three times in his Binghamton debut, a 5-3 win against Hartford on Oct. 3. ... When defenseman Kyle Quincey skated onto the ice during the Colorado Avalanche's 5-2 season-opening win against San Jose on Oct. 1, it marked a milestone for the Griffins franchise. Colorado became the 30th and final NHL club for which a former Griffin has played since the team's inception in 1996. ... Rookie netminder Thomas McCollum, who made 23 saves to lead Grand Rapids to a 3-1 win at Peoria on Oct. 3, is the youngest goaltender ever to play for the Griffins (19 years, nine months). ... A standing-room-only crowd of 5,411 fans packed the Glens Falls Civic Center on Oct. 3 to watch the Adirondack Phantoms take on the Worcester Sharks. It was the arena's largest turnout for an opening night in the 21 seasons of AHL hockey in Glens Falls. ... Milwaukee forward Cal O'Reilly picked up an assist on Ian McKenzie's game winning-goal against Chicago on Oct. 3, giving him 167 assists for his career and making him the team's all-time assists leader since it joined the AHL in 2001. ... Rockford, which was one of three AHL teams without an overtime loss in 2008-09, dropped a 3-2 OT decision in its 2009-10 opener Oct. 4 at Peoria. ... Andrew Gordon became the second Hershey skater in as many seasons to notch a hat trick in the club's initial game of the season, on Oct. 3; Graham Mink accomplished the feat Oct. 8, 2008, at Wilkes-Barre/Scranton.